MOBE Makes A Triumphant Return! 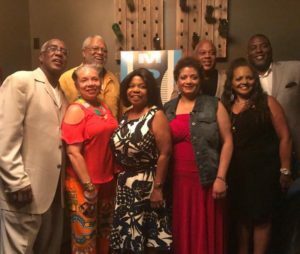 Under the leadership of Co-Founder, Yvette Moyo and 2017 Chairman, Curtis Symonds , with a team of lifelong loyali sts and supporters, this past weekend The Marketing Opportunities in Business and Entertainment Conference (MOBE) made its triumphant return back, relaunching in Atlanta! “MOBE is back to continue our tradition of helping the next generation of leaders, innovators, and creators achieve success, develop strong business alliances, and lifelon g relationships,” states Moyo. The MOBE Conference kicked off Thursday, Augus t 17th with the #MOBE2017 Welcome Reception hosted by Yvette Moyo and Curtis Symonds, who were joined by a vast network of supporters/partners/and sponsors including two Atlanta based firms The Bronner Bros and Liquid Soul Marketing with additional sponsorship from Prudential, Combined Insurance, and support from Atlanta’s Black Chamber of Commerce and The Mayor’s Office. A highlight of the evening was a special greeting from Cox Communications President Patrick Esser, who was recognized for the role he plays in making sure diversity and inclusion are woven into the corporate fibers at Cox. 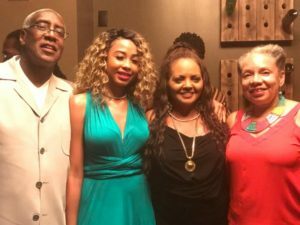 Also in attendance was Bernard Bronner, President and CEO of Bronner Brothers a major sponsor of MOBE, who invited registrants to Celebrate 70 Years Of Beauty with The Bronner Bros. International Beauty Show, the largest convention in the Southeast. Yvette Moyo which discussed how brands can deliver their message with cultural competence. The Social Justice panel (from left to right): moderator Obari Cartman , H.E.L.P. LLC; Ayinde Cartman, Executive Director of Real Men Charities; Rev. Otis Moss, III, Social Justice Activist and Pastor, Trinity United Church of Christ; and DJ Greg Street, radio personality at V103 Radio in Atlanta. 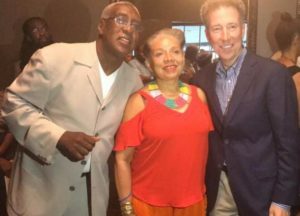 Following the Social Justice session was “The Future And Now Of Music” moderated by Ken Rye, founder and CE O of Ken Rye Marketing and featuring Jill Kettles, Miss Jill PR; Award-winning producer, musician and entrepreneur Craig A. King. Unlike other conferences where the speakers leave immediately after their panels, at MOBE, the panelist s stick around, network, and make themselves completely available for one on one connections. 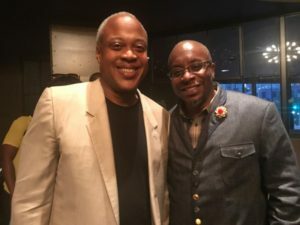 DJ Greg Street joined the conversation as an unofficial participant offering sage advice to emerging artist asking for guidance on the best way for emerging artist to get exposure. Diversity in technology continues to be an important national conversation for tech companies and venture capital firms and, in turn, a huge area of opportunity for people of color and tech entrepreneurs. During the “Producing Content for a Multiplatform Marketplace,” moderated by Deborah Gray of D. Gray Young Consulting, Detavio Samuels, iONE Digital & One Solution President, shared some tips on how to go from ideation to execution and discussed the importance of branded content in increasing engagement. “We are definitely in an era of content explosion right now and there are tremendous opportunities for those who want to participate. Never before have we been in a moment in time where there are so many distribution partners and people who are acquiring, creating content. The tech explosion is creating new opportunities for people who want to be in the media and entertainment space regardless of the size of the company.” Joining Samuels on the panel from left to right was Whitney Mari Headen, head of Life Currency and former head of digital marketing, Essence and Jay Jackson of Ryse Media. from left to right: Detavio Samuels, president of iOne Digital and One Solution; Whitney Mari Headen, head of Life Currency and former head of digital marketing, Essence and Jay Jackson of Ryse Media. Attendees were inspired by the next guest, life strategist, empowerment speaker and author, Sheri Riley whose question of the day, “What will you give up? What are those things you will commit to so your greatness is revealed?” set the tone for an engaging conversation around her new book, Exponential L iving: Stop Spending 100% Of Your Time on 10% Of Who You Are. The conversation segued seamlessly into a life strategy session with Prudential Executive,Dorinda Walker, whose forthcoming book is a testimony that if you have the vision, you can rise above anything. Saturday’s “Millennial Marketing” panels included: Michiel Perry, Black Southern Belle; Aleeta Bell, founder and creator of the Pluhg APP; LaToya Shambo of Black Girl Digital, and Tasha Levy, Multicultural Lead, Global Marketing Solutions for Facebook. 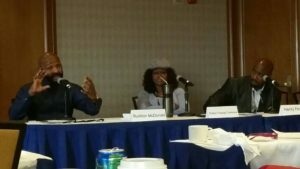 On the ” Growing Small Properties ” panel, MOBE registrants gave real-time feedback and suggestions to the heads of Real Men Charities , Super Bowl Gospel and HBCU Network . 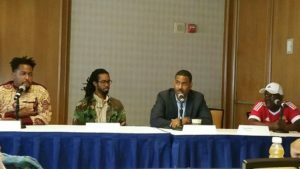 The sports panel “Raising Your Game To The Next Level”, was moderated by radio broadcaster Doug Stewart and featured Kevin Merida , EIC of The Undefeated/ESPN and sportswriter Robert “Scoop” Jackson . The day ended with the TV panel ” In Front Of and Behind The Camera “, moderated by PR executive Chelsye Burrows and featuring TV executive Rushion McDonald , producer and writer Sharon Thomas Tomlinson and actor Henry Frost III . 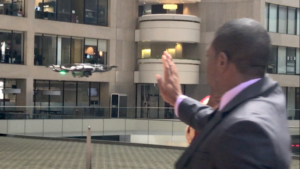 Terrance X. Johnson, CEO of TCJ Aerotech (the only African-American drone manufacturer in the country), demonstrates a Drone they’ve invented that can be operated with simple hand moments. 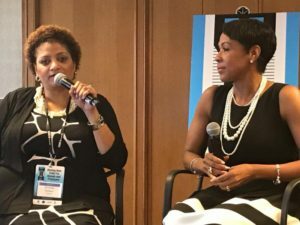 More than $187 million in business was generated to African-American companies as a direct result of associations and relationships conceived at MOBE symposiums. You don’t want to miss the next one! For more information about the conference and a full list of sessions/events, please visit Mobesymposium.com and follow them on socials. Must-Attend Summer Conferences for Business Professionals, Techies and Entrepreneurs!